Can I contribute code where I do not own copyright? What is the relationship between WAMP, Autobahn and Crossbar.io? What does open-source license mean for me when I use it for a project? What is the license for the application templates? Can I hack Crossbar.io to fit my own needs? I want to contribute to Crossbar.io - what do I need to do? Can I integrate a non-WAMP application into my WAMP application? Crossbar.io is an open source networking platform for distributed and microservice applications. It is a feature rich, scalable, robust and secure implementation of the open Web Application Messaging Protocol (WAMP). WAMP is a WebSocket sub-protocol, which means that you can communicate with browser using it. In addition to that it can also run over any transport which is message-oriented, ordered, reliable, and bi-directional such as TCP, Unix domain socket, etc. Crossbar.io is a WAMP router with advanced features implemented in the Python language. It is agnostic to the implementation of the client or its deployment. The below overview shows WAMP clients in different languages communicating with each other. The team behind Crossbar.io also maintains a set of WAMP clients as part of the Autobahn project. Apart from that there are also numerous third-party implementations of WAMP clients in different languages. The Crossbar.io is a multi process architecture. A single instance of Crossbar.io is called Crossbar.io node. When a Crossbar.io node starts, initially it starts a single process called node controller. The node controller is the master process of everything. The node controller reads the configuration file locally and starts multiple worker processes such as router, containers and guest workers. Routers are the core facilities responsible for routing WAMP messages. Containers are Autobahn Python clients which runs natively as part of Crossbar.io. Guests are applications other than routers and containers ,e.g. a nodejs application etc. The node reads the configuration file locally and starts the workers according to it.
" -- configuration work is done here --"
Above is an example of a bare minimum config.json. Here if present, controller must be a dictionary and workers, if present must be a list of dictionaries. Each entry of dictionary in the worker is a worker process. It is defined by its type as router or container or guest. The node controller can run multiple routers, components and guest workers, For example If there are three routers then there will be three dictionary entries within the worker section with the type router. a detailed explanation of the configuration is explained in the upcoming section. Routers are the core facilities of Crossbar.io, responsible for routing WAMP remote procedure calls between Callers and Callees, as well as routing WAMP publish-subscribe events between Publishers and Subscribers. To start a router the following things needs to be defined. A realm is equivalent to a namespace. Crossbar.io uses realms as domains for separation of routing and administration. The router needs to provide at least one realm for applications to communicate through. A realm can be optionally protected by authentication and authorization. The access control of the topics and procedures within a particular realm is defined by roles. The roles define permissions to allow,deny or authorize access to topics and procedures. Every WAMP session between Crossbar.io and a Client is always attached to a specific Realm. It is not possible for a client connected in a particular realm to see clients of other realm. Roles defines the permissions for WAMP clients of a given realm, to use an URI(topic or procedure). It is possible to define a common rule for all URIs and specific rules for some particular URIs. The rules allow or disallow action such as publish, subscribe, call and register. These rules can be defined by a static authorization or a dynamic authorization. In dynamic authorization, the router calls a component (Python client) and the component performs authorization. Authentication with Crossbar.io determines if a WAMP Client is allowed to connect and which identity it is assigned, while authorization determines which permissions a Client is granted for specific actions based on its identity. Transports are necessary for allowing incoming connections to Routers. Crossbar.io provides WebSocket and RawSocket Transport. The transport run over transport endpoint and Crossbar.io supports the following transport endpoints: TCP, TLS, Tor and Unix Domain Socket. Unless specified the port number of the listening port is 80 and incase of TLS it is 443. In addition to that there is Web transport which serves the purpose of web service, WSGI, redirection, file upload or CGI etc. Firstly Docker needs to be installed on your machine. The official Docker site provides instructions on how to get Docker running in your respective operating system at https://docs.docker.com/install/. All the examples here have been tested on Ubuntu 18.04 LTS using Docker, with commands for *nix shell, but work on other platforms with adaptation. For other methods of installation refer to the Installation Guide. The example code that we are going to use here is available at Crossbar Examples. There are plenty of examples there in the repository; we are going to use the getting-started. The -p 8080:8080 argument exposes and maps the port inside the container to the local machine. The option -v $PWD:/node mounts the getting-started folder of the host to the /node of the docker container. The getting-started folder contains the configuration file at .crossbar/config.json, The Crossbar.io will find it at /node and boots using it. This makes it easy to edit the config json locally and start it in Docker. [Controller      1]     Copyright (c) 2013-2018 Crossbar.io Technologies GmbH, licensed under AGPL 3.0. [Controller      1] Initializing <class 'crossbar.personality.Personality'> node from node directory "/node/.crossbar"
[Controller      1] New node key pair generated! [Controller      1] Node key loaded from "/node/.crossbar/key.priv"
[Controller      1] Node configuration loaded from "/node/.crossbar/config.json"
[Controller      1] Starting router worker "worker-001"
[Controller      1] Starting new managed worker process for Router worker "worker-001"
[Router         13] Starting worker "worker-001" for node "983fa84fda45" with personality "standalone"
[Router         13] Starting router realm "realm-001"
[Router         13] Starting role "role-001" on realm "realm-001"
[Router         13] Starting router transport "transport-001"
[Router         13] Creating router transport for "transport-001"
[Router         13] Router transport created for "transport-001"
[Router         13] Starting "nodeinfo" Web service on path "info" of transport "transport-001"
[Controller      1] Local node configuration applied successfully! Open your favorite browser and navigate to the address http://localhost:8080/info. This should give the below output. If the Crossbar.io runs as expected - Congratulations! The first step towards building your next IOT application is done successfully. The Crossbar configuration file is defined using a JSON or a YAML formatted file. The configuration by default will be loaded from CBDIR/config.json or CBDIR/config.yaml. We will be covering in detail about the configuration in the advanced topics. As of now we will see the basic usage here. Now lets have a look at the config.json of the Docker image that we are running. You can also copy the config.json from running Docker using the command $ docker cp crossbar:/node/.crossbar/config.json . But it is not required since we are mounting the host folder to docker we can access the config.json directly. The configuration entries are explained below in Line no - Description format. 7 - defines the worker to the type router. 35-63 - transport dictionary entry. 36-38 - defines the type web. It is a type of transport where it allows websocket, web services to use the same port. The Crossbar.io identifies the packet using its header. 49-61 - defines the web transport entry. each entry in the path defines a route to HTML page. 59 - This entry creates the nodeinfo page http://localhost:8080/info which was verified earlier. In the configuration you can see the line “name”: “realm1” which configures the realm to be “realm1”. An the port number is configured as 8080 “port”: 8080. When connecting to this Crossbar router instance we need to use this particular realm and port number. The config file used in the example is also available here. In this example we will be using the Crossbar.io running in the Docker instance. 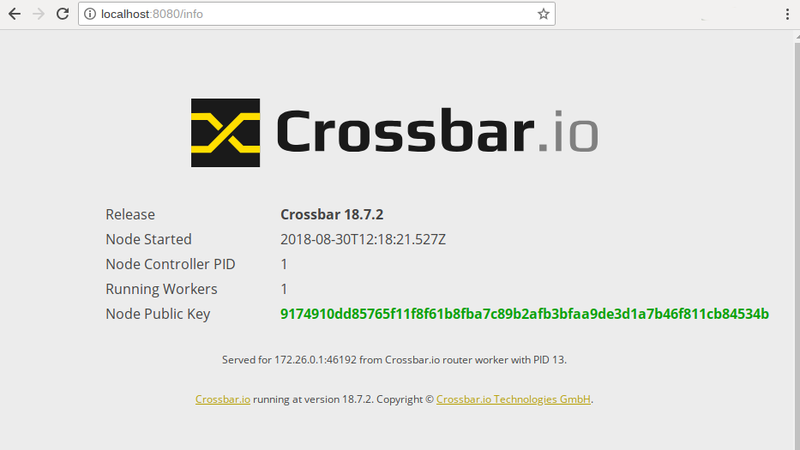 Both the publisher and subscriber client will connect to Crossbar.io using the realm and the port number as mentioned in the configuration file. Once connected the publisher client will publish the string “Hello world” along with a count to the topic “com.myapp.hello”. The subscriber client will listen to the topic “com.myapp.hello” and exits after receiving 5 events. The Docker image is started with client_component_publish.py as its application along with the URL and realm passed as environment variable. Here in the URL the IP address points to the linked container name. The option -v $PWD:/app mounts the getting-started folder of the host to the /app of the docker container. This makes the python script located in host, accessible in docker container. Use the same realm value as in the crossbar router. Supplying a wrong realm will disconnect the client. The Autobahn Python project supports two APIs: Appsession (inheritance based) and Component. All the examples displayed here are based on the Component API. In the crossbar-examples/getting-started repository, examples of both the type (Appsession and Component) are available, it can be identified with filename containing component or appsession in it. Apart from that the Autobahn Python support two asynchronous frameworks twisted and asyncio. The current example is twisted based. The Python code client_component_publish.py reads the URL and the realm from the environmental variable and stores them in the local variable. Using the URL and realm the client connects to the Crossbar.io which is listening in the localhost at port 8080 with the single given realm realm1. When client successfully gets connected to the Crossbar.io, a session is created and then the callback function joined is notified. Using the session it is now possible to publish, subscribe, call or register a call. This example just publishes using the api publish as shown below. The WAMP supports following data types in serialization integer, string, bool, list, dict. Please see the specification for more details. The connection.open creates a new connection to the Crossbar.io using the give URL and realm. When a session is successfully created the onopen function is called back, where the onevent1 function is subscribed to the topic com.myapp.hello. Please try the above example on your own. The NodeJS example publishes “Hello World” to the topic “com.myapp.hello” and quits. This is not a full blown application but just an example to provide an outlook of a Nodejs application. Please try the example on your own. Moving on we will cover the next important feature of the Crossbar - Remote Procedude Calls. Here a WAMP client will register a subroutine (i.e. a function) to a particular topic - to be called by some other client; hence it is called Callee. The Caller client can use the topic and call the remote procedure. The Callee client will implement the date procedure and register it to the topic com.myapp.date, the Caller can call the date function to know the date of that particular client. The script will register a procedure named com.myapp.date. As explained in the previous examples, the boiler plate code is the same here. When a session is created between Crossbar.io and client, the onopen function is called. Here the function utcnow is registered as a time service procedure with URI com.myapp.date.When the caller calls, the result of utcnow is sent back. Leaving the boiler place code, we can see that the application calls the remote procedure com.myapp.date and prints the output. It is not possible to register the same RPC twice, unless you explicitly allow Shared Registrations. The containers as-is are there to demonstrate the principles. To develop your own applications, you need to modify the code they run as well as the Crossbar.io config file. The application components are in the /app directory of Autobahn Python Docker x86_64 , armhf, aarch64 . The Crossbar.io configuration file is in the .crossbar subdirectory. Basic concept of WAMP and Crossbar.io.